I just love a freebie and it's even better when the freebie is absolutely gorgeous! That's how I feel about this Sale-A-Bration freebie called Avant-Garden. It will be available from 4th January FREE with a purchase of $90. Better yet - it's just one of many stunning offerings in Sale-A-Bration this year. First I made a sheet of background cardstock using two of the stamps in the set. I stamped onto Whisper White card with Sahara Sand and second generation Sweet Sugarplum (that is, I stamped off onto scrap paper first). The sheet of card that I stamped was almost A4 in size so you'll see it on a few projects in the next few days! I next stamped the detailed flower three times onto a piece of Whisper White and coloured it with Watercolour Pencils and an Aqua Painter. I then cut it out with an oval Stitched Shape Framelit. I used the next size up of Stitched Shape Framelit to cut out a piece of Sahara Sand card and then added layers of Sweet Sugarplum and Rich Razzleberry using the Layering Ovals die set. I stamped the greeting in Basic Black onto a piece of Sweet Sugarplum and cut it out with one of the Project Life Cards & Labels framelits. I added a layer under it cut from Rich Razzleberry card with one of the other dies from the same set. 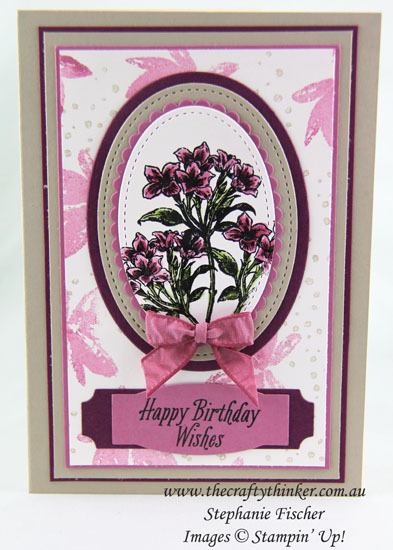 The base card is Sahara Sand to which I added layers of Rich Razzlebery, Sahara Sand, Sweet Sugarplum and finally the stamped background. The final touch was a bow made with the Sweet Sugarplum Ruched Ribbon. To find out more about Sale-A-Bration and how to make the most of it, visit my Sale-A-Bration page or contact me.